On this day in 1945, the Dachau concentration camp was officially liberated. The eyewitness accounts of troops and survivors testify to the atrocities that were only beginning to be known to the world. Yet even out of these pits of despair came examples of faith, courage and hope that continue to inspire us. 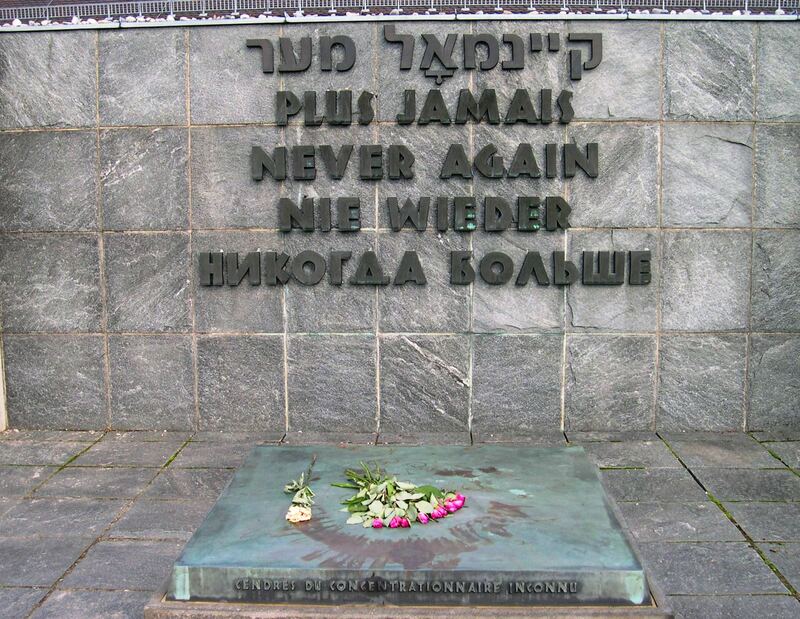 When we visited Dachau in August 2005, it was a haunting reminder that there have always been those who “bear with unbearable sorrow” and somehow survive. May we remember those who suffer, and open our eyes to ways we can help. And may this brief remembrance enable us to see more clearly the many blessings of our lives today. An important message Julia. It’s just inconceivable. I will never forget Roberto Benigni movie ‘La Vita e Bella’. The strength and the sorrow was more than I could manage, I cried all the way thru. That is one of my very favorite movies of all time. It’s one of less than half a dozen DVDs that I own. I also have the music CD. That movie is simply beautiful. Funny, sad, deeply touching. By an odd coincidence, I ended up seeing that movie in a theater one night after I saw “Saving Private Ryan” in a theater (and I hardly ever go to movies in theaters). Seeing those two movies back-to-back was especially meaningful. The brutal reality of one is tied to the brutal reality of the other, and the characters somehow find their way through it all, even though some pay with their lives. Oh my gosh, you must have used a lot of tissues that night. We also saw both in the theatre, I barely made it thru the opening credits of ‘Saving Private Ryan’. Sobbing from the get go. ‘Life Is Beautiful’ was equally moving but in a very different way for me. I think my eyes were practically swollen shut by the end. Yes, the two movies are very different, which is one reason it was interesting to see them in proximity to each other. Despite the tragedy in “Life is Beautiful” it is a very positive and uplifting movie I think. “Saving Private Ryan” is much more somber, no comic relief or romance to break the tension. Shelia, it does make sense. There are times when I will postpone or avoid heartrending true stories in books and movies because I know I’m not in a frame of mind to be able to handle the emotional fallout. In fact, I sometimes avoid the newspapers for that very reason (I quit watching TV long ago). I also avoid most violent movies but occasionally I have made an exception and sometimes the message of the movie is such that I’m glad I watched it. I do think we need to be careful to have a balanced diet for our minds, and not dwell too much on evil, sorrow, or pain. But I also think awareness of sad and difficult things can result in our being more compassionate. For example, I think a lot of people tend to keep a certain distance from our family because they have a hard time dealing with the ongoing reality of Matt’s disabilities and health issues, and the many ways our family is affected. For some people this distance may simply be a form of snobbery or prejudice, but for most I think it’s just that it makes them sad to realize how hard life can be for some people. It’s just easier for them not to think about it. While I sympathize with this and have felt that way myself at times, ultimately it’s not an option for any of us, since we will all eventually face sad times and we depend on having others who are willing to be there with us through the difficulties and pain. I know you understand this or you wouldn’t be here! And I’m so glad you are! It’s been a rainy, gloomy day here too. I hope we have a bit of sunshine tomorrow. Thanks for your visits and your comments! Julia, as I came back to read your reply today, I thought of our business, and all the blessings we have received from “special” people with various disabilities. There have been situations of laughter, tears of joy, clapping, high “fives”, and so much more. It has been so rewarding and we really believe God works through us. I’m sorry our society has become rather veneer. I think caring from the inside out feels so good! Sheila, I’m so happy you have been able to experience firsthand the joy of being with some of the most loving and affectionate people on earth. They are, as George will writes of his son Jon, who has Down Syndrome, “an adornment to a world increasingly stained by anger acted out.” Caring from the inside out is not only more fun, but it’s also more transparently genuine. Matt has often been able to sense people’s attitudes toward him, and he is drawn to those who care. God does indeed work on this earth through people who show love to others. Thanks so much to you and Bill for being among those!